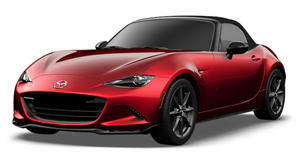 We still don’t have full details on the all-new 2016 Mazda MX-5 Miata. Which engine(s) will it have and at what power output? What’s the final curb weight going to be? What new technologies will it bring to the table? These are just a few questions Mazda will provide answers to in good time. Remember, the new MX-5 still won’t go on sale for another year. Another question many have been wondering is whether or not Mazda will continue to offer the retractable power folding hardtop option. The MX-5 prototype shown at the premiere last week had the familiar folding soft top. And now Automobile magazine is claiming that, at least for the first model year, no hardtop will be available. You can only get the outgoing third-gen MX-5 with a hardtop if you opt for either the Club or highly equipped Grand Touring trims. But it does make sense for Mazda not to have that hardtop at first because the main emphasis of the new MX-5 is weight reduction. Any folding hardtop adds a considerable amount of weight. However, if in the future there’s enough demand, don’t be surprised to see Mazda oblige.